We are pleased to announce Ultiworld’s 2018 D-III All-America teams. These 14 players were selected for their performance in the 2018 college season, looking at both the regular season and the full college Series, including Nationals. Please join us in honoring the best college players of this season. Also be sure to check out our Player of the Year and other individual awards from the 2018 D-III college season. What else is there to say about Tulsa Douglas? 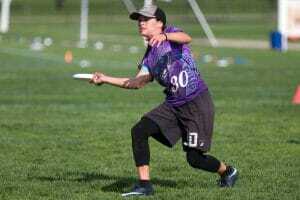 She is an all-around talent of the highest caliber D-III ultimate has to offer: she can put a disc in the hands of cutters nearly anywhere on the field she wants to, even when under pressure. 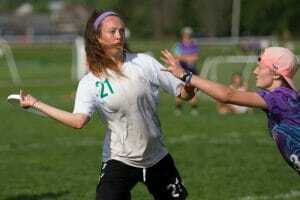 She has the defensive prowess and awareness that made her a threat when the disc wasn’t in her hand. She has the focus and attention to lead a line–and an entire team–to digging deep and controlling the moment they’re given, and worked her way to her spot as 2018’s D-III Women’s Player of the Year. Douglas was the player who helped bring home a championship, one layout D and backhand break look at a time. Her bright career has yet to hit its peak. Josie Gillett has helped transform Bates Cold Front from a middle-of-the-pack Regionals team into a 2018 title contender thanks to her offensive talents. With her field vision and pinpoint hucks, Gillett was a danger in the backfield other teams simply could not ignore this year. 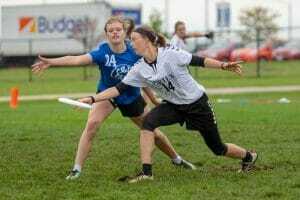 Unafraid of sending the disc down the length of the field or matching up on another team’s top handler for some shutdown defense, Gillett was as versatile as her throws were varied, and a player any team would want anchoring their handler set. Gillett will be the top thrower to watch for in 2019, and the question any team will need to answer if they want to take down Bates. With an impressive amount of length and internal fire, Lecinsky was one of the division’s best all-round players for Williams. While their final performance left something to be desired, their success was in no small part due to Lecinsky, who displayed the speed and strength to dominate on defense or push the pace on offense. What she lacked in game-changing throwing ability, she made up for with plus athleticism, effort, and understanding. For her to perform this well while ostensibly playing out of position is testament to her talent and willpower. Yost was a fireball for Georgia College and continued on the path to stardom after last year’s breakout campaign earned her the award of the same name. Even as a known talent, Yost only pushed the bar higher, carrying an inexperienced team to the bracket at Nationals. Her 27 assists on the weekend were fourth in the division, and she added six goals. It wasn’t uncommon to see this mobile handler take every other pass, of nearly every type, on the way to piloting Lynx Rufus to a goal. She played nearly every point, taking on the tough matchups available on both sides of the disc. With sparkling quickness, tenacious decisiveness, and her signature bomb forehand, Yost was impossible to miss, a bullet whizzing towards her goal. As part of a senior trifecta with Juliet Chung and Dana Waxenberg, Cannon was consistently and effectively the downfield piece of the equation that brought Lehigh such success. In her cutting she could beat her defender and get open with ease, finding space and success with her speed. Even when the disc wasn’t intended for her, she consistently made a play and turned garbage into gold to keep the momentum going. She also brought the same awareness and playmaking talent on defense–earning Defensive Player of the Year for it–and earned her spot on All-American for being able to turn around and bring in the score after the turn with her hands that can catch almost anything. Her two-way play was superb, and Lehigh relied on her a great deal to provide that caliber of play game in and game out, point after point. With consistency and power, Cannon delivered again and again. Katrina Meserve was awarded Offensive Player of the Year for her efforts to lead Mount Holyoke to their best Nationals finish in team history. Even that doesn’t properly reflect just how strong of a performance she put on in Rockford. The offense ran through Meserve, as she was third for the tournament in assists and tied for 12th in goals across just five games. Her strong breaks and hucks enabled her young athletic team to take advantage of the entire field. Katrina used her height and athleticism to contribute to the defense as well, often being tasked with containing other All-Americans such as Gillett, Yost, March, and Castro when they crossed paths. Mulhern scored 30 goals at Nationals. The next highest individual tally was 19. Mulhern was easily the most consistently dangerous cutter in Rockford, showcasing an impressive ability to find separation from defenders and space in the end zone. Mulhern was also second on her team in assists, but it was her goal scoring ability that garners her spot on this team. 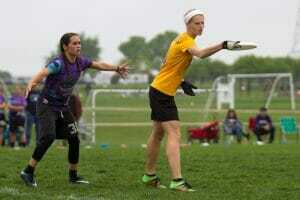 She was able to get open for full field hucks as adeptly as she was at timing her cuts perfectly in the red zone. Her ability to be dangerous at every level of the field is what made her such a weapon this year, and one of the top performers in the country. The 2018 Donovan Award winner showed how she earned the respect of her peers in just about half of the tournament at Nationals. She showed up when RPI needed her in the beginning of bracket play, and delivered with speed and intensity. Austin felt like a one-woman wall in the active space of the RPI zone and was the top downfield option after the turn. While her stats weren’t kept, anybody in Rockford could see just how efficient she was, torching defenders for unders, winning battles to the cone for goals, and shutting down cuts with fervor and skill. When Chung was on the field, you noticed her for both being a lefty and for being absolutely fearless in her hucks. In tandem with teammate and 1st Team selection, Madison Cannon, Chung drove the offense with her deep backhand looks that sliced across the field and put her mark on notice. 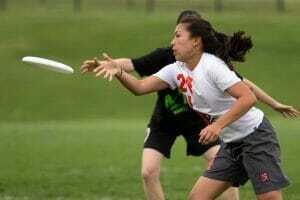 Beyond the way she wielded her left-handed throws, Chung embodied the Lehigh playing style of speed, blistering in her upline cuts, always up for some give-and-go connections before putting the disc deep. When Chung stepped on the line, the product was clean, aggressive throws that found her cutters and advanced her offense, and garnered respect from her opponents. Emma March from Oberlin didn’t shoulder the responsibility that other Donovan finalists did, but March was as efficient as anyone whenever she stepped on the field. Oberlin was running more even lines than other teams, but it was clear that it was a different game when March was playing. Her backhand break and just about every one of her throws were exactly as advertised as she connected on 11 assists. The senior was a smooth thrower, with length and touch to place the disc effectively. To complement her ability to break the mark, she also set a devastating mark, restricting even the most gifted throwers to a small window. Puget Sound Clearcut had another successful run, tying for third yet again at Nationals in 2018. A strong piece of keep that run alive over the weekend came from the cutting flow and defensive capabilities of senior Abby Mayo. Mayo had more than a knack for finding open space and coming down with the disc on offensive; even stronger ws her penchant for making plays and getting up in the air in zone to take over. 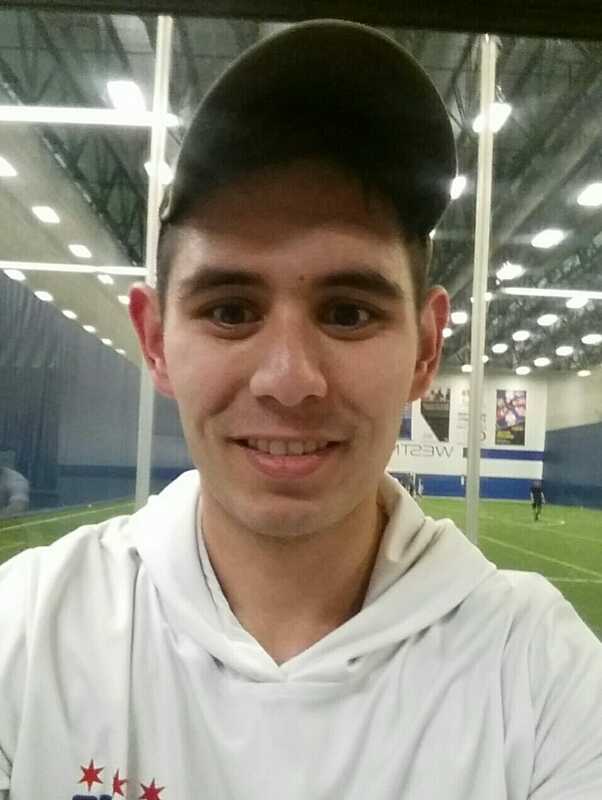 As runner-up for Defensive Player of the Year, putting Mayo in the position to attack an incoming disc was a way to find success and get back on offensive quickly. Castro was selected as one of the Donovan finalists, and led Catholic University from the No. 16 seed to end Nationals tied for 9th. Castro was dominant in small spaces, using quick handler cuts to create opportunities against a trailing mark so she could seek out her downfield threats for quick scores. Her 17 assists in just five games was good for a tie for sixth on the weekend. Castro was the benefactor of poor weather Sunday, where her composure and throws took over to give Catholic their two wins on the tournament. The lefty sophomore handler was one of the top discoveries of Nationals, a previously hidden gem in the D-III women’s landscape. 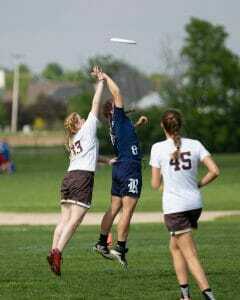 Wahaus oozed agility, both with and without the disc, deft at creating space for both her throws and her cuts. Marks struggled to match up with her dangerous break throws that left defenders with nowhere to hide and paced the RPI offense. 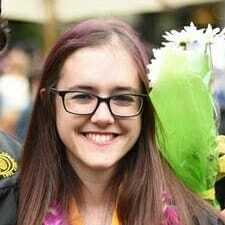 She finished tied for sixth at Nationals in assists, leading a group of unexpected contenders, in large part because of Wahaus’ tremendous growth and productivity. As one of the younger All-Americans, Wahaus has the opportunity to leave a significant mark on the division in the years to come. Bates relied on their depth more than just about any other team in the division, providing star handler Josie Gillett with an impressive cutter core with which to slice up opposing defenses. But Warder was the most important of that group. She didn’t lead the team in goals at Nationals, though she did register 16, a number good enough to tie for fifth most in Rockford. But she was the most consistent option for teammates, and one of the more impressive defenders on the season as well. Just a sophomore, Warder is a big part of Bates’ very bright future, as she proved in 2018 to be one of the most solid and impressive players in the division. Comments on "D-III Women’s 2018 All-American Teams, Presented by VC Ultimate & NUTC"